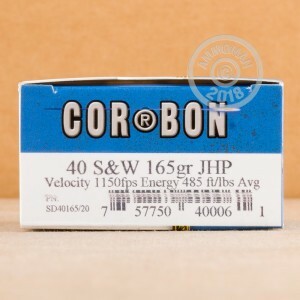 This self-defense ammunition from Corbon is a great choice for .40 S&W handguns and comes in an economical 500 round case. Each cartridge fires a light 165 grain jacketed hollow point bullet at 1,150 feet per second (muzzle velocity achieved with a 4-inch test barrel). This results in more reliable expansion and good penetration for strong terminal performance overall. While not as "hot" as some Corbon loads, it still produces the snappy recoil that frequent .40 S&W shooters are familiar with. Corbon ammo is loaded in Sturgis, South Dakota using non-corrosive Boxer primers and reloadable brass cases. 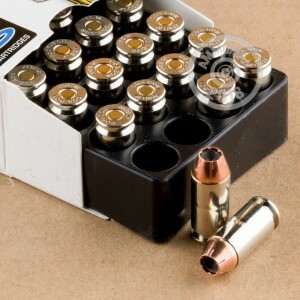 Buy this 500 round case (or anything totaling over $99) and get free shipping from AmmoMan.com!